I love making stir fry dishes because they are soo easy to make! All of the ones that I use are very quick to make and taste great. One thing to keep in mind as you make stir fry dishes: don’t be afraid to change the ingredients and come up with your own variation of the meal. Just make sure that you are using healthy ingredients and you should be fine! 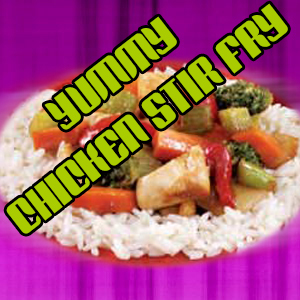 To make this chicken stir fry, boil 1 cup of water and add in brown rice. Once you have added the rice and the water has boiled, cover the pot, turn down the heat and let it simmer according to the cooking instructions for the rice. Then, heat half of the olive oil in a pan and cook chicken and place it on a plate. Then cook the vegetables in the pan with the juices from the chicken and 1 tbsp of the chicken broth. Saute all the vegetables until tender. Finally, mix together the remaining olive oil, chicken broth, soy sauce, ginger, garlic, and honey in a small bowl and pour it over the vegetables. Then add the chicken back to the pan, and stir-fry for another 1-2 minutes. Add this to the rice and you’re done!